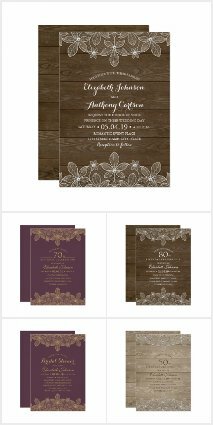 Unique Lace Engagement Party Invitations – Elegant Country Cards. Luxury vintage engagement invitations. Feature a beautiful rustic lace and a unique stylish typography on a bluish grey background. You can easily change background color to any color you like. A romantic invitation perfect for rustic country themed, or other engagement parties. This creative engagement invitation is fully customized. Just add your engagement celebration details. Start with ordering your first sample.